One of the first things that I learnt about New Zealand is that it’s a country built on volcanoes merged out of the ocean – How cool is that?! When I moved to New Zealand what I was most excited about was this, and the fact that I would be living on volcanic islands, surrounded by mountains and grounds made of lava. In the end of March I had the pleasure of visiting Wai-O-Tapu Thermal Wonderlands, situated in Rotorua on New Zealand’s North Island. 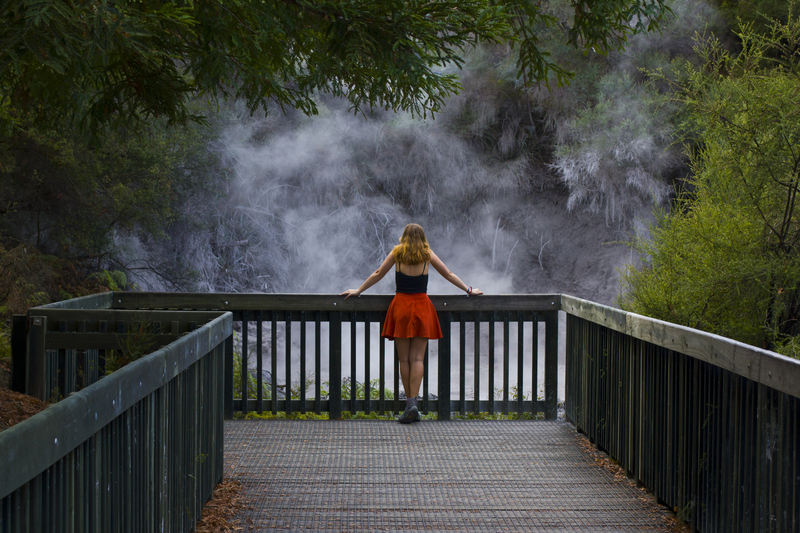 Rotorua is associated with volcanic activity dating back to about 160,000 years ago and is located right on the edge of the largest volcanic caldera within the active Taupo Volcanic Zone. 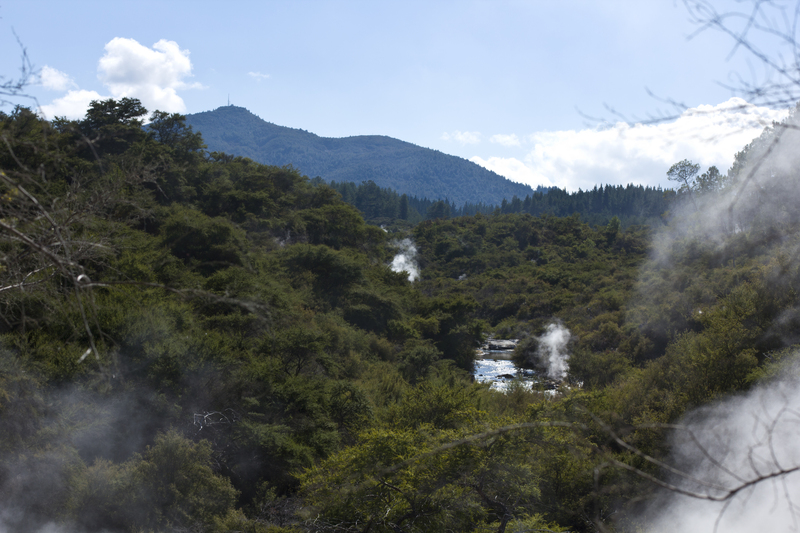 When we entered the grounds of Rotorua I noticed that there was random smoke coming out of the forests and that the mountains were filled with what looked like small fires. When I expressed my concern I was told that nothing was in danger. The random steam that I saw as fires are actually openings in the planet’s crust, also called steaming fumaroles, which is superheated water turning into steam as its temperature drops when it emerges from the ground. 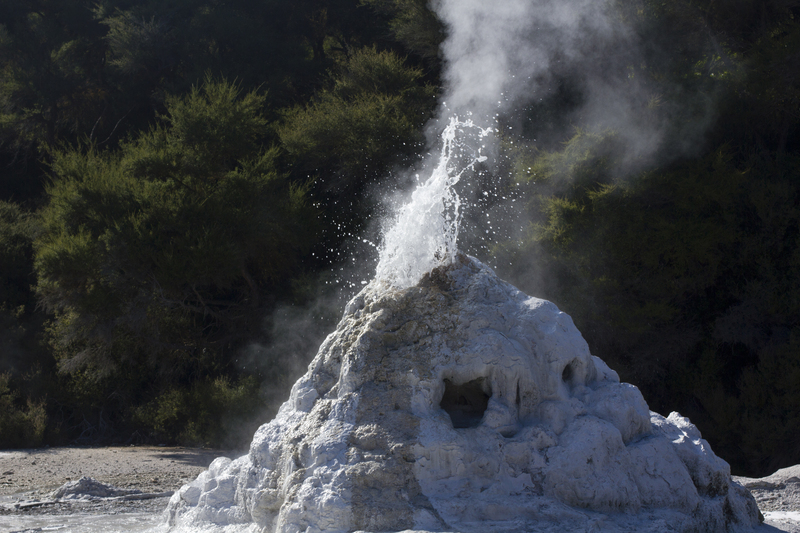 These fumaroles can often be found in volcanic areas and are completely normal for Rotorua. 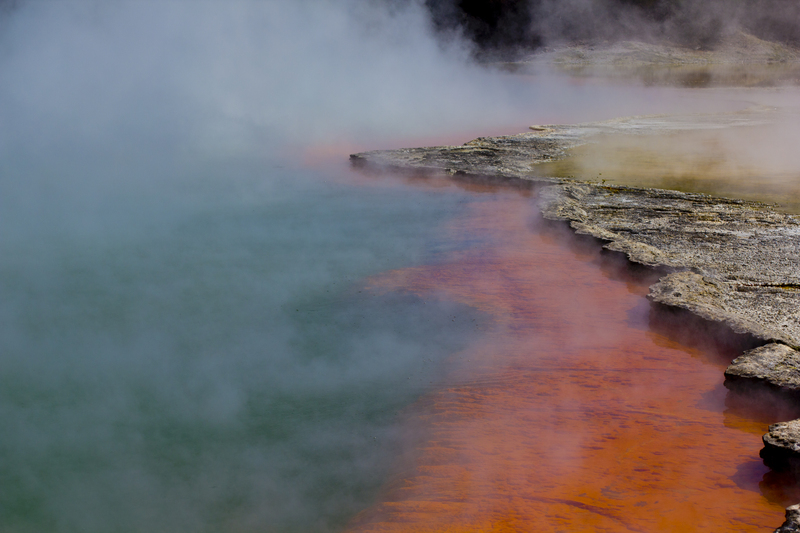 They emit steam and gases such as carbon dioxide, sulfur dioxide and hydrogen sulfide which is what’s responsible for Rotorua’s distinctive smell of “rotten eggs”… a smell that actually neutralizes with time, and wasn’t all that horrible… whether you believe it or not :). Least to say, this days adventure was going to turn out to be one of the most unique and colorful nature experiences I’ve ever had. Not only is the park itself an amazing experience but the landscape surrounding it is totally mesmerizing. 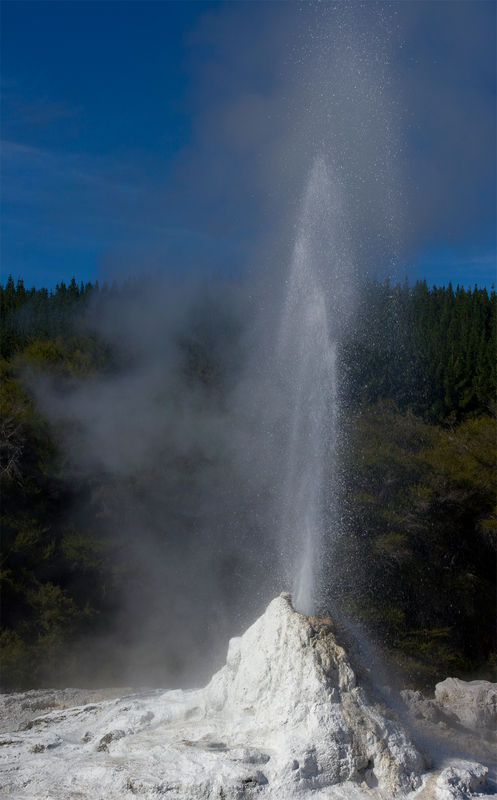 At 10.45 am Lady Knox, Wai-O-Tapu’s famous geyser, showcased her powers and shot her insides up to 20 meters up in the sky. With bubbles and sparkling water she sprinkled the daredevils sitting on the closest seats – A talent that had been discovered by prisoners when they accidentally dropped their soap into her roaming belly back in the early 20th century while trying to do their laundry. People were clapping their hands and cameras were running warm trying to capture the magnificence of the steaming performance. The Champagne Pool was formed when the land erupted about 700 years ago and has now been measured to be 65 meters wide and about 62 meters deep. Carbon dioxide and natural minerals charged from the bottom of the spring reaches the surface at 75 degrees Celsius but the water below the Champagne pool can reach a heat up to 260 degrees Celsius. Not necessarily a pool you’d want to go for a swim in but definitely a pool to explore from above! The intense colors in the Champagne Pool are all natural and are due to different mineral elements, the predominant colors being orange for Antimony and green for Colloidal sulfur/ferrous salts. Another pool of unnatural looking nature that really impressed me was the Devil’s bath, shown below. 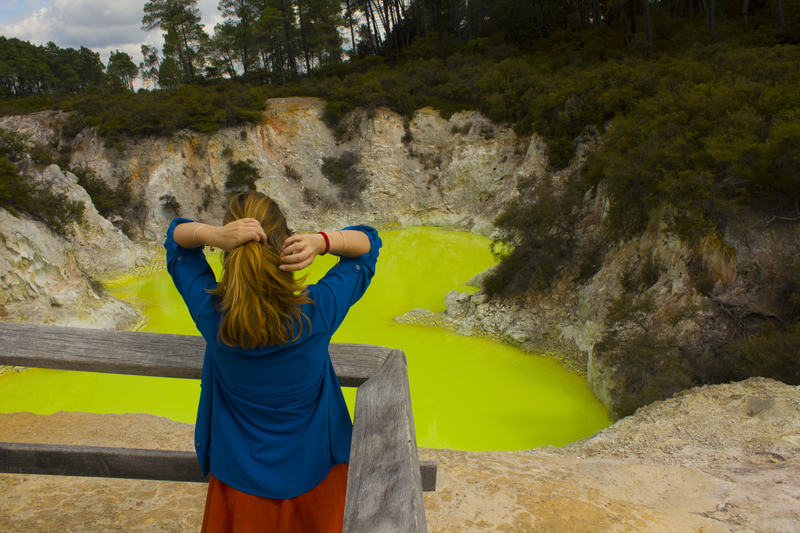 The water gets its toxic looking lime green color from deposits of sulfur and minerals that rise to the surface and end up floating on top of the water. This pool was a joy to photograph because of its detailed cracks surrounding the edges, the color of the water and the fact that it’s viewed from above which is making it quite unique on photos. As a scenic reserve, all native flora, fauna and geological formations are strictly protected and the general public sees only a small portion, all to make sure that New Zealand’s most unique nature stays this way. Something very different that was definitely worth the little extra drive out of the park was the mud pools. 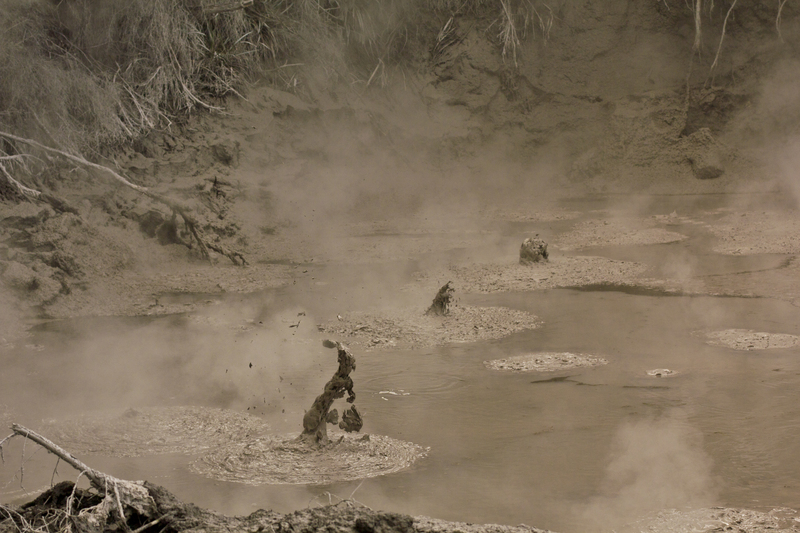 It might sound simple but wow, there’s something very satisfactory and extraordinary about bubbling mud surrounded by gray smoke and green forests. Watching the thick textured pool of brown mud shoot in the air randomly was such a pleasure. I ended up standing next to an old man for awhile… We were both in a meditating states, mesmerized by the sound of the mud boiling from deep below and as the bubbles popped out of the surface from all around us we both giggled like children. The sound is similar to boiling pumpkin soup, but even more fun! I think it’s so amazing how the nature of our world can still surprise us no matter how old or educated we might think we are… and that some people grow up surrounded by nature of this kind considering it as normal. Just as I know thermal wall insulation indoors and wild moose outdoors to be normal having grown up in Sweden, people who live in Rotorua find thermal hot pools and steaming fumaroles in the middle of the city normal. There will always be something out there, out of our mind and our bubble (pun intended), to surprise us when we least expect it. This day I was in for way more steaming treats than I could’ve ever imagined. 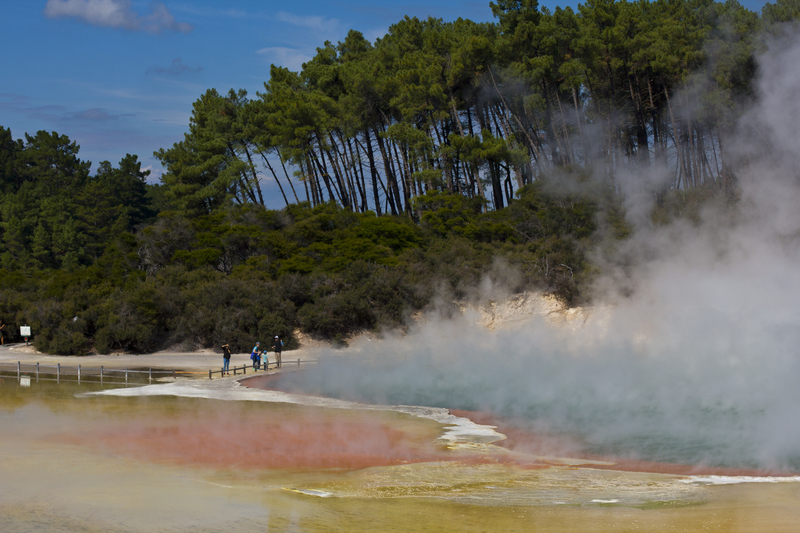 Big thanks to Wai-O-Tapu Thermal Wonderland for having me! If you end up on New Zealand’s North Island I very much recommend a visit to this wonderland – a part of NZ’s natural treasures not to be missed. What’s your most memorable natural adventure? Tags: Nature, new zealand, North island, NZ Nature, purenewzealand, rotorua, Thermal wonderland, travel, wai-o-tapu, Waiotapu thermal wonderland. Bookmark the permalink. The colours are so vibrant !! I’ve seen geysers and hot spring in Iceland and in Yellowstone, but I would LOVE to visit these ones !it looks so gorgeous ! Thanks a lot for your comment and I’m so sorry for my late reply. New Zealand really is a wonderful place, did you make it there yet? I’ve always wanted to go to both Yellowstone and Iceland! You’re so lucky, must have been such an adventure. Did you write any posts about these travels? Yes, a wonderful place! Looks great from the air also, thanks so much for sharing, great photos, it was cloudy and wet when I was last there.